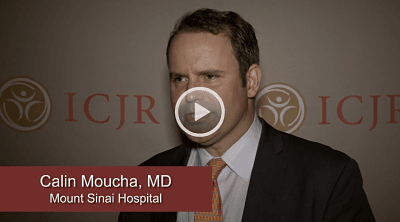 Cailin S. Moucha, MD, from Mount Sinai Hospital in New York, has performed direct anterior approach and posterior approach total hip arthroplasty (THA), and recently he conducted a retrospective chart review to compare his patient outcomes with the 2 approaches. The bottom line: THA is a successful operation, and in general, patients will do well with the approach the surgeon feels comfortable performing. One approach may have certain short-term benefits – for example, his direct anterior approach patients were more likely to be discharged home, and to be discharged sooner – but in the longer-term, differences between the approaches may be negligible. Click the image above to hear Dr. Moucha discuss his study, “Anterior vs. Posterior Approach for THA: Analysis of LOS, Discharge Destination, Readmission, and Revision” (Poster 095), which was presented at the 2016 Annual Meeting of the American Academy of Orthopaedic Surgeons in Orlando. Previous articleICJR Interviews: Should Surgeons Use Articulating or Static Spacers? Next articleICJR Interviews: Does Resident Involvement Increase Morbidity or Mortality?